After our husband and father Chaim Zev Moskowitz, of blessed memory, passed away on Lag B’Omer 5766, we made inquiries into the writing of a sefer Torah to commemorate his memory. A prolonged search led us to Mr. Betzalel Ehrlich , a resident of Chispin on the Golan. In spite of the distance from our home in Rehovot, we were immediately convinced that we had found the most suitable person to write the sefer Torah. As time passed, we discovered the special qualities and characteristics that radiated from this unique personality. We were convinced of Betzalel’s integrity and were impressed by the modesty of this talmid chacham (wise person) who spared no time or effort to help us, without concern for compensation. He stayed within the predetermined time limit and the end result is most impressive by any standard. Careful research reassured us that his handwriting and the quality of his materials are of the highest caliber. We will be happy to furnish details to interested parties. 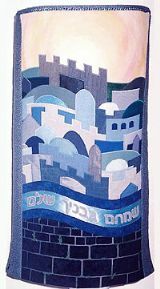 Click for a Torah scroll catalog.